A constable and RCMP police dog "Juice" approached the suspect, David Cochrane, arrested him and took him into police custody. 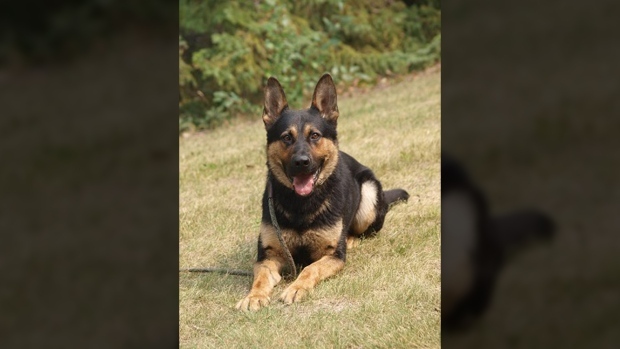 A police dog and an alert neighbour are being credited with helping police catch a prolific offender with a significant history of offences throughout Vancouver Island and Alberta. On Feb. 4, a resident of south Nanaimo reported a vehicle partially blocking a driveway on Young Road. Officials determined the silver Fiat was stolen from the Duncan area three days before. Police followed the stolen vehicle to a residence on Wexford Road and attempted to stop it. The driver tried to evade arrest and in the process damaged two police vehicles. Cochrane was taken to hospital where he was treated for several minor dog bites. His next court appearance is on Feb. 12. Mounties say Cochrane recently arrived on the island and hasn't wasted any time becoming acquainted with officers in Nanaimo, Duncan and Port Alberni. It's believed he is involved in a number of property related investigations in those areas. Before arriving in B.C., Cochrane was active in Grande Prairie, Alberta where he is charged with five counts of possession of stolen property and other property offences.